Recent advances in the understanding of cellular and molecular biology of glioma have led to the development of novel therapeutic approaches including new targeted therapeutic modalities.,,, Along with this evolving development, there has been a paralleled growth in the multimodality imaging technology ranging from structural imaging to functional and targeted molecular imaging., Despite these advancements, there has been only a modest improvement in the survival of glioma patients. The scenario is more difficult to imagine in the case of recurrent glioma, as the survival in this subset of patients remains dismal. More problematic is the differentiation of true recurrence from treatment-related changes as the two have a gray zone in terms of both clinical presentation as well as imaging findings. Chemoradiation, a recent therapeutic modality, causes more treatment-induced changes than either radiotherapy or chemotherapy alone. In addition, radiation-induced changes might frequently present simultaneously with true tumor recurrence both spatially and temporally.,, All these factors account for the difficulty of current imaging modalities in differentiating recurrent tumor from treatment-related changes more reliably. Moreover, the newly developed novel therapeutic modalities might add to complexity of the already complex situation of differentiating these two widely varied conditions to an extent beyond what we currently understand. The need for noninvasive imaging modalities with high accuracy of discriminating the two entities still continues. Conventional anatomical imaging modalities such as computed tomography (CT) and magnetic resonance imaging (MRI) suffer from serious drawbacks in differentiating recurrent tumor from treatment-related changes. Consequently, functional imaging modalities such as functional MRI, magnetic resonance spectroscopy, single photon emission computed tomography (SPECT), and positron emission tomography (PET) are increasingly being used in recent times with heterogeneous results.,,, PET with different radiotracers provides functional information such as glucose metabolism, tumor perfusion, amino acid transport, cell proliferation, and hypoxia. Nevertheless, F-18 fluorodeoxyglucose (F-18 FDG) is the most widely used PET radiotracer and it traces glucose metabolism in tumors. Recurrent gliomas are characterized by higher F-18 FDG uptake than the adjacent brain parenchyma while treatment-induced changes show lesser or no uptake with the exception of a few depending on the timing of imaging after radiotherapy, type of radiation, and type of tumor. F-18 FDG PET is useful in grading, in differentiating tumor recurrence from radiation necrosis and in the prognostication of brain tumors, notably gliomas., More recently, positron emission tomography-computed tomography (PET-CT) with the perfusion tracer N-13 ammonia (N-13 NH3) has also been found useful in brain tumors including gliomas.,,, Its efficacy in differentiating recurrent tumor from treatment-related changes also appears encouraging, and recurrent tumors seem to have high perfusion coupled with high metabolism. However, similar to F-18 FDG, this tracer also shows high physiological uptake in background normal brain parenchyma, which might cause underestimation of active tumor due to low target-to-background ratio.,, Furthermore, its short half-life of 10 min limits its availability to centers where cyclotron is available. SPECT, on the other hand, has suffered a major setback due to the poorer spatial resolution compared to PET. However, new technical advances such as improved reconstruction algorithms, hybrid technology in the form of single photon emission computed tomography-computed tomography (SPECT-CT) coupled with its low cost, widespread availability, longer half-life tracers, and also the possibility of using multiple tracers simultaneously could herald a rebirth of this technology. Tc-99m glucoheptonate (Tc-99m GHA), among other SPECT tracers, is a blood–brain barrier (BBB) agent. In addition, an active transport mechanism of this glucose analog has also been suggested for its uptake by active tumor cells., Tc-99m GHA has shown high accuracy in discriminating tumor recurrence from treatment-related changes.,,,,, No study has systematically compared the efficacies of Tc-99m GHA and N-13 NH3 in differentiating recurrent glioma from treatment-related changes. The present prospective study aims at performing a head-to-head comparison of the efficacies of Tc-99m GHA SPECT-CT and N-13 NH3 PET-CT in the detection of recurrent glioma. After obtaining approval from the institutional review board, patients were prospectively enrolled. Prior informed consent was obtained from all the patients. 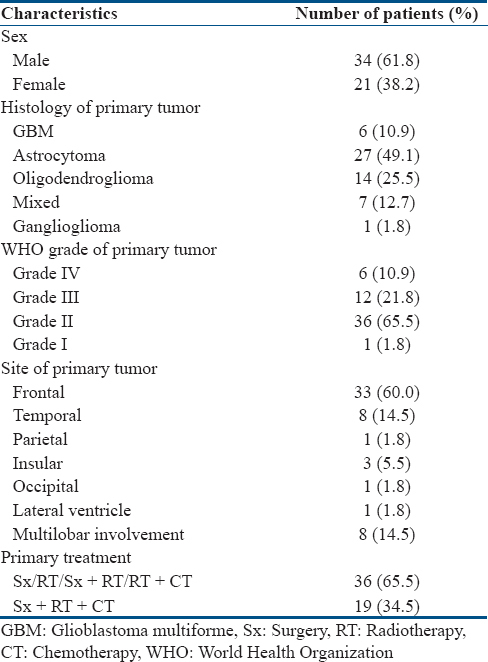 Fifty-five consecutive patients with histologically proven and previously treated gliomas presenting with clinical suspicion of recurrence were enrolled in the study. Previous treatment included surgery and/or radiotherapy with or without concomitant chemotherapy. Exclusion criteria included nonglioma brain tumors, malignancy elsewhere in the body, and refusal to give informed consent. The decision to include the patients in the study was made by the treating neurosurgeon or radiation oncologist based on clinical assessment. N-13 NH3 PET-CT and Tc-99m GHA SPECT-CT were performed in all the patients within a week span in random order. Contrast-enhanced MRI was also performed in all the patients with a contrast-enhancing lesion considered positive for recurrence. N-13 NH3 was synthesized by the 16 O(p, α)13 N reaction in a medical cyclotron (Siemens) using 11 MeV protons with methodologies as previously reported. A dedicated Siemens PET-CT scanner (Biograph 2; Siemens Medical Solutions, Erlangen, Germany) was used to perform the PET-CT scans. With the patient lying supine on the scanner table, 444–592 MBq (12–16 mCi) of N-13 NH3 was injected intravenously. The acquisition began 3–5 min after the radiotracer injection. After the initial topogram acquisition, noncontrast CT scan was performed on the dual-slice spiral CT of the PET-CT system with a slice thickness of 4 mm, pitch of 1 and using a matrix of 512 pixels × 512 pixels, the pixel size being 1 mm. PET data were acquired for 5 min for one bed in 3D mode using a matrix of 128 pixels × 128 pixels and a slice thickness of 1.5 mm. CT data were used for attenuation correction of the emission data and anatomical correlation. PET images were reconstructed by iterative method-ordered subset expectation maximization (two iterations and eight subsets) with a Gaussian filter of 5 mm. CT images and fused images of matching pairs of PET and CT images were generated for review in axial, coronal, and sagittal planes, as well as in maximum intensity projections and three-dimensional cine mode. Tc-99m GHA was prepared by adding Tc-99m pertechnetate eluate to the sterile, ready-to-reconstitute kit obtained from the Board of Radiation and Isotope Technology, Mumbai, India (kit code: TCK-15). Patients were injected with 925 MBq (25 mCi) of Tc-99m GHA intravenously. After a waiting period of 1 h, SPECT-CT scan was performed with the patient supine and head fixed keeping as close to the collimator as possible in the dual-head SPECT-CT system (Symbia T6; Siemens Medical Solutions). The photopeak was set at 140 keV with 20% energy window. SPECT was acquired in “step and shoot” mode with a period of 20 s per view for 64 views using a matrix of 128 pixels × 128 pixels. After the SPECT acquisition, CT was acquired with the patient in the same position on the 6-slice spiral CT of the hybrid SPECT-CT system with a slice thickness of 5 mm, pitch of 1.5, and matrix of 512 × 512. Images were processed on the commercially available e.soft (Siemens Medical Solutions, Knoxville, TN, USA) software. SPECT images were reconstructed by iterative method-ordered subset expectation maximization (two iterations and eight subsets). CT data were used for attenuation correction and anatomical correlation. Attenuation maps were created from the input CT image by converting the CT numbers to attenuation numbers, using lookup table, based on both CT effective energy spectrum (kVeff) and the emission isotope energy. SPECT emission images were coregistered and fused with the transmission CT images using object versus target matrix method. Fused emission and transmission images were visually inspected for the correctness of coregistration. Reconstructed images were displayed for review in axial, coronal, and sagittal planes, as well as in maximum intensity projections and three-dimensional cine mode. Two experienced nuclear medicine physicians, blinded to the clinical and radiological findings, evaluated the N-13 NH3 PET-CT and Tc-99m GHA SPECT-CT images. PET-CT images were analyzed on a dedicated workstation (Syngo, Siemens Medical Solutions). The areas on the PET images and CT images were always corroborated. PET-CT was considered positive if there was an unequivocally increased uptake with or without a discernible lesion on CT images or if there was a definite lesion on CT images showing uptake more than or equal to that of the surrounding brain parenchyma on PET images. In doubtful cases, fusion of PET and MRI data was performed. Furthermore, nonattenuation corrected data were corroborated where necessary to exclude overcorrection. A consensus diagnosis was made where a discrepancy arose. For semiquantitative analysis, circular regions of interests (ROIs) were carefully drawn around the site of abnormal uptake/primary tumor site/lesion on CT in the consequent PET-CT slices spanning the full extent of the abnormal uptake/primary tumor site/lesion on CT but excluding the first and last slices to avoid partial volume effect. The slice with the maximal uptake was chosen for the quantitative measurement (standardized uptake value maximum [SUVmax], standardized for body weight). Similarly, SUVmax values of the contralateral white matter at the level of centrum semiovale and contralateral gray matter at the level of the abnormal uptake/primary tumor site/lesion on CT were measured. From the above values, tumor to white matter uptake ratio (T/W) and tumor to gray matter uptake ratio (T/G) were derived. For Tc-99m GHA SPECT-CT, image analysis was also done on a dedicated Syngo nuclear medicine workstation (Siemens Medical Solutions), SPECT and CT images being always corroborated. Any abnormal focus of increased radiotracer uptake in the brain parenchyma more than the background was considered positive for recurrence. As done for PET-CT, fusion of SPECT and MRI data was performed in doubtful cases, and a consensus diagnosis was made where a discrepancy arose. For semiquantitative analysis, ROIs were drawn surrounding the abnormal uptake/primary tumor site/CT lesion in the consequent SPECT-CT slices spanning the full extent of the abnormal uptake/primary tumor site/CT lesion but excluding the first and last slices. The slice with the maximal counts per pixel (CPP) was chosen for the quantitative measurement. Similarly, CPP of the contralateral cerebral hemisphere, scalp, and nasopharynx were also calculated. From the CPP values, lesion-normal contralateral hemisphere (tumor-normal ratio [T/N] = maximum CPP in tumor area/average CPP in normal contralateral hemisphere), lesion-scalp (tumor-scalp ratio [T/S] = maximum CPP in tumor area/maximum CPP in the scalp), and lesion-nasopharynx (tumor-nasopharynx ratio (T/NPX) = maximum CPP in tumor area/maximum CPP in the nasopharynx) ratios were derived. A combination of clinicoradiological follow-up, repeat imaging, and biopsy (when available) was taken as the reference standard. Histopathology was considered the reference standard in those who underwent reoperation. In the remaining patients, disease-related hard events (death or clinical progression) or persistent/progressive disease on follow-up imaging were regarded as positive for recurrence. Various descriptive statistics including mean, median, range, standard deviation, and frequencies were used to describe the various demographic and baseline profiles of the patients. Sensitivity, specificity, positive predictive value (PPV), negative predictive value (NPV), and accuracy with 95% confidence intervals were calculated for each modality. McNemar test was used for head-to-head comparison of the two modalities. After performing normality testing of the distributions of the quantitative variables by the Kolmogorov–Smirnov test, Mann–Whitney U-test was used to assess the differences in the quantitative parameters derived on each modality in relation to the reference standard. Receiver operating characteristics curve (ROC) analysis was used to derive the optimal cutoff values of the quantitative variables in relation to the reference standard. Area under the curve (AUC) was calculated for each modality and compared. A P value of < 0.05 (2-tailed exact significance) was considered significant. Statistical packages IBM SPSS 22.0.0 (IBM Corp., Somers, New York, USA) and MedCalc 12.3.0 (MedCalc Software, Mariakerke, Belgium) were used for the statistical analyses. A total of 55 consecutive patients with a mean age of 38.9 ± 12.2 years and a median age of 41 years (range, 7–63 years) were enrolled in the present study. The duration between end of primary treatment and enrollment into the study was 43.8 ± 41.3 months (median, 30 months; range, 6–219 months). Other patient characteristics are summarized in [Table 1]. Based on the reference standard, 28 (50.9%) patients (WHO Grade IV – 4, Grade III – 5, Grade II – 18, and Grade I – 1, respectively) had recurrent disease. For those who did not die during follow-up, the duration of follow-up was 26.8 ± 5.4 months (median, 25.5 months; range, 19–35 months). Twenty-three patients (41.8%) expired during the follow-up (overall survival: mean, 11.3 ± 6.2 months; median, 10 months; range, 4–26 months). Thirteen patients (23.6%) underwent reoperation. Follow-up data and patient outcomes are shown in [Figure 1]. Repeat imaging with both the modalities was performed in 4 patients of whom, two expired and one was still alive during follow-up. The other patient had recurrent disease on reoperation. Overall, N-13 NH3 PET-CT was positive in 25/55 patients of which, 22 were true positives while 3 were false positives. It was negative in 30 patients of which, 24 were true negatives and 6 were false negatives. In low-grade gliomas, it was positive in 15/37 patients (all true positives) and negative in 22 patients (with 4 false negatives). In high-grade gliomas, it was positive in 10/18 patients (with 3 false positives) and negative in 8 patients (with 2 false negatives). Sensitivity, specificity, PPV, NPV, and accuracy of N-13 NH3 PET-CT are given in [Table 2]. Tc-99m GHA SPECT-CT was positive in 28/55 patients of which, 24 were true positives and 4 were false positives. It was negative in 27 patients of which, 23 were true negatives and 4 were false negatives. On subgroup analysis, Tc-99m GHA SPECT-CT was positive in 17/37 low-grade glioma patients (with 2 false positives) and 11/18 high-grade glioma patients (with 2 false positives). It was negative in 20/37 low-grade gliomas patients (with 4 false negatives) and 7/18 high-grade glioma patients (all true negatives). Sensitivity, specificity, PPV, NPV, and accuracy of Tc-99m GHA SPECT-CT are summarized in [Table 2]. MRI revealed contrast-enhancing lesions in 40/55 patients of which, 26 were true positives and 14 were false positives. It was negative in 15 patients with 13 true negatives and 2 false negatives. MRI was positive in 26/37 low-grade gliomas (with 9 false positives) and 14/18 high-grade gliomas (with 5 false positives). It was negative in 11/37 low-grade gliomas (with 2 false negatives) and 4/18 high-grade gliomas (all true negatives). The two modalities were concordant in 46/55 (83.6%) patients and discordant in 9 (16.4%) patients. In the concordant 46 patients, both the modalities were positive in 22 patients (all showing contrast enhancement on MRI) with 2 false positives, while the remaining 24 patients were negative in both the modalities (10 showing contrast enhancement on MRI) with 2 false negatives. In those 9 patients with discordant findings, Tc-99m GHA SPECT-CT was positive in 6 patients with 4 true positives. MRI also revealed contrast enhancement in all these 6 patients. Of the remaining 3 patients with negative Tc-99m GHA SPECT-CT and positive N-13 NH3 PET-CT findings, the latter was found to be correct in detecting recurrence in 2 patients, one of whom did not show positive finding on MRI. MRI was positive in 2 of these 3 discordant patients (true positive – 1, false positive – 1, and false negative – 1). Both N-13 NH3 PET-CT and Tc-99m GHA SPECT-CT had high overall diagnostic accuracies of 83.6% and 85.5%, respectively, the difference being not statistically significant on McNemar test (P = 0.508). Overall, N-13 NH3 PET-CT and Tc-99m GHA SPECT-CT were false positive in 3 and 4 patients, respectively, of which 2 were common in both the modalities. Of the two patients with false-positive findings on both the modalities, one (anaplastic oligodendroglioma) was found to be radiation necrosis on reoperation while the other (anaplastic astrocytoma) revealed no clinical progression on 19-month follow-up [Figure 2]. The patient with anaplastic oligodendroglioma had a definite CT lesion with increased uptake in the white matter of the contralateral frontal lobe associated with significant edema causing effacement of the lateral ventricle while the patient with anaplastic astrocytoma had increased uptake in the corpus callosum with significant white matter edema. The patient with false-positive finding on N-13 NH3 PET-CT only (anaplastic astrocytoma) had diffuse uptake in the occipitotemporal lobes without any CT lesion or significant edema, which was subsequently proven as radiation necrosis on reoperation [Figure 3]. The two patients with false-positive findings on Tc-99m GHA SPECT-CT only (one with astrocytoma and the other, oligodendroglioma) showed no clinical progression on 33 months and 29 months of follow-up, respectively. The patient with astrocytoma had increased uptake in the ipsilateral frontal lobe with associated significant edema and effacement of ipsilateral lateral ventricle while the patient with oligodendroglioma had a hyperdense CT lesion with increased uptake in the ipsilateral frontal lobe without any associated edema. All the above 5 patients with false-positive findings on one or both the modalities also showed contrast enhancement on MRI. Overall, N-13 NH3 PET-CT and Tc-99m GHA SPECT-CT were false negative in 6 and 4 patients, respectively, of whom 2 were common on both the modalities. The 2 patients with false-negative findings on both the modalities were both histologically astrocytomas, one died at 6 months after the scans while the other underwent follow-up scans with both the modalities after 6 months. Both scans revealed increased uptake in the ipsilateral periventricular region with subtle hypoisodense lesion on CT. Patient died 2 months later. MRI revealed a small area of contrast enhancement in the former patient while it was also negative in the latter patient. Of the 4 patients with false-negative finding on N-13 NH3 PET-CT only, one patient with astrocytoma was found to have recurrent tumor on reoperation with change in grade to anaplastic astrocytoma and patient subsequently received radiotherapy. On the follow-up scans before the reoperation, N-13 NH3 PET-CT was still negative while Tc-99m GHA SPECT-CT revealed progression. Baseline MRI was also positive in this patient. All the remaining 3 patients with false-negative findings on N-13 NH3 PET-CT only (glioblastoma multiforme – 1, oligoastrocytoma – 1, and anaplastic astrocytoma – 1) had clinical progression and died during the follow-up. The patient with glioblastoma multiforme received chemotherapy after the baseline scans, and there was significant response to treatment on the follow-up Tc-99m GHA SPECT-CT and MRI with temporary improvement in clinical symptoms [Figure 4]. The patient later died at 13 months after the baseline scans. The patient with oligoastrocytoma had progression on follow-up scans including follow-up MRI. The patient died at 20 months after the baseline scans. The patient with anaplastic astrocytoma had multifocal disease detected on both Tc-99m GHA SPECT-CT and MRI. The patient died 5 months later. Both the 2 patients with false-negative findings on Tc-99m GHA SPECT-CT only were astrocytomas; one died at 11 months after the scans [Figure 5]. MRI was also positive in this patient. In the other patient, active disease was detected only on N-13 NH3 PET-CT (baseline MRI was also negative). The patient developed debilitating clinical deterioration (bedridden) during the 25-month follow-up, and follow-up MRI revealed disease progression. N-13 NH3 PET-CT performed better in low-grade tumors (accuracy, 89.2%) than in high-grade tumors (accuracy, 72.2%). On the other hand, Tc-99m GHA SPECT-CT had high accuracies in both low-grade and high-grade tumors with a better performance inclining toward the latter subgroup (low grade, 83.8% and high grade, 88.9%). However, there was no statistically significant difference in the performances of the two modalities in both low-grade (P = 0.687) and high-grade tumors (P = 1.000). Uptake ratios on each modality were significantly higher in those having recurrent disease than in those who had no recurrence as shown in [Table 3]. The various cutoff values of the semiquantitative parameters for the diagnosis of recurrent tumor on each modality derived by ROC curve analysis are shown in [Table 4]. Among these, T/G on N-13 NH3 PET-CT and T/S on Tc-99m GHA SPECT-CT had the largest AUC and thus had the highest diagnostic accuracies, respectively (0.825 for T/G and 0.828 for T/S). Comparison of ROC curves of the two uptake ratios derived on the two modalities did not yield any statistically significant difference (P = 0.992 for T/G vs. T/N, P = 0.959 for T/G vs. T/S, P = 0.808 for T/G vs. T/NPX, P = 0.688 for T/W vs. T/N, P = 0.645 for T/W vs. T/S, and P = 0.871 for T/W vs. T/NPX). PET using different radiotracers providing functional information has emerged as a useful modality in differentiating recurrent glioma from treatment-induced changes. Recently, the utility of the perfusion tracer N-13 NH3 in recurrent glioma has been emphasized. Recurrent tumors seemed to exhibit high perfusion as shown by recent studies using this tracer; however, the problem of low target-to-background activity still persists.,, On the other hand, Tc-99m GHA is a cheap and readily available SPECT radiotracer. These properties along with advancements in SPECT technology encouraged researchers to revisit the utility of this modality in recurrent brain tumors.,, To the best of our knowledge, this is the first prospective clinical study to systematically compare Tc-99m GHA SPECT-CT and N-13 NH3 PET-CT in glioma patients with suspicion of recurrence. In the present study, N-13 NH3 PET-CT was found to have high diagnostic accuracy (overall, 83.6%; low grade, 89.2%; high grade, 72.2%). Due to the lack of systematic clinical studies using this modality exclusively in recurrent glioma and the heterogeneity of tumor types coupled with very small sample sizes in the literature, the accuracy inferred from our study could not be compared vis-à -vis the current literature.,,,, On the other hand, Tc-99m GHA SPECT-CT was also found to be highly accurate. The sensitivity, specificity, and accuracy (85.7%, 85.2%, and 85.5%, respectively) in the present study is at par with that reported by Santra et al., Karunanithi et al. reported that Tc-99m GHA SPECT-CT had a sensitivity, specificity, and accuracy of 86.4%, 62.5%, and 80%, respectively. The lower specificity in their study could be due to the inclusion of relatively large number of high-grade tumors with a high proportion of recurrent disease in the study sample. The false-negative findings of N-13 NH3 PET-CT in 6 patients could be due to the high normal background activity in the brain rendering the target-to-background ratio suboptimal. Tc-99m GHA SPECT-CT was false negative in 4 patients. It has been postulated that false-negative findings on this modality could be due to small lesion size and proximity of the lesion to scalp or nasopharynx where normal tracer uptake is very high. False negativity has also been seen in posterior fossa tumors due to high background activity and in Grade I tumors because of intact BBB. As explained in the results, one of the 2 patients with false-negative findings on both the modalities and baseline MRI showed increased tracer uptake on the follow-up scans after 6 months. This could be due to small lesion size, normal perfusion, intact BBB, or a combination of these at the time of baseline scanning. All the 4 patients with false-negative findings on Tc-99m GHA SPECT-CT are Grade II astrocytomas. The possibility of intact BBB in low-grade astrocytomas could be an explanation for the absence of uptake in these patients on the modality as disruption of BBB is the main mechanism for the uptake of Tc-99m GHA. Metabolic trapping of N-13 NH3 with the help of glutamine synthetase enzyme is the main mechanism for its cerebral uptake while the upregulation of this enzyme in gliomas could be responsible for the high uptake in these tumors., Recently, He et al. have demonstrated that N-13 NH3 is retained in gliomas cells by de novo glutamine synthesis mechanism, especially in glutamine-deficient tumors due to higher glutamine synthetase enzyme expression, which may catalyze the synthesis of more glutamine, and in turn make more N-13 NH3 retain in cells. Reactive gliosis, to some extent, with high glutamine synthetase activity might be seen in radiation necrosis., This might be the reason for the false-positive findings in 3 patients; two of them were proven as radiation necrosis on reoperation. 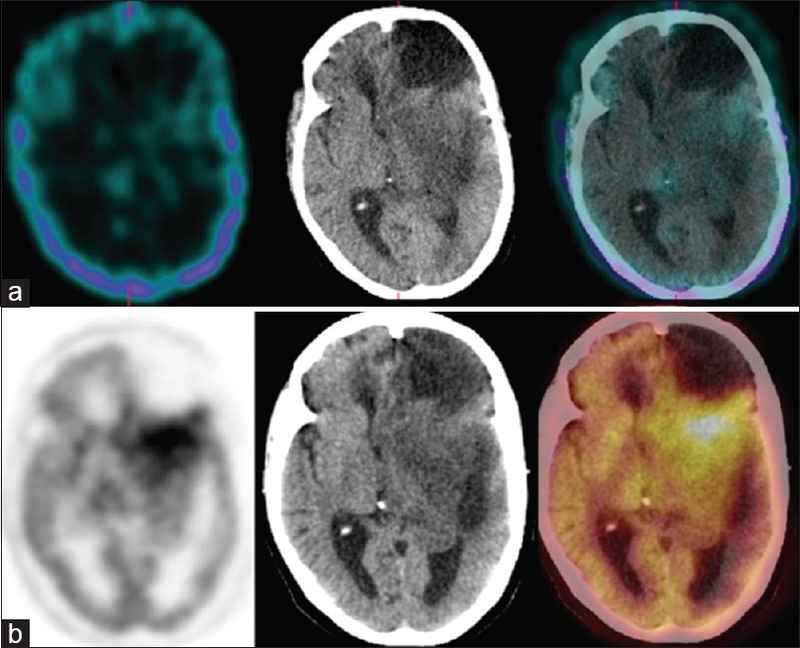 Another theoretical explanation could be the presence of subclinical seizure activity associated with increased perfusion in radiation necrosis. Xiangsong et al., in a recent study using N-13 NH3 PET, found no uptake in both the untreated oligodendroglioma patients. The authors opined that the absence or very low expression of glutamine synthetase enzyme in oligodendroglial tumors could be responsible for the negative findings in these tumors. In our present study, N-13 NH3 PET-CT was found to be highly accurate in oligodendroglioma patients (Grade II oligodendroglioma, 11; Grade III anaplastic oligodendroglioma, 3). The modality was correct in 13/14 oligodendroglioma patients, 4 of them were proven on reoperation with histology revealing recurrence with transformation to higher grade. It was false positive in 1 patient of anaplastic oligodendroglioma; the histology on reoperation showed radiation necrosis. Glutamine synthetase is mainly seen in astrocytes, but oligodendroglial tumors often contain a mixed population of cells, predominantly astrocytes. This finding coupled with the frequent transformation into higher grade often with mixed cellular histology might account for the high accuracy of N-13 NH3 PET-CT in the present study. Moreover, the different tumor biology of recurrent oligodendroglioma from untreated ones might also account for the discordant findings in such tumors between our study and that of Xiangsong et al. Future studies with N-13 NH3 PET-CT and glutamine synthetase staining in different histological subtypes of both treated and untreated glioma might validate these findings. Tc-99m GHA SPECT-CT was false positive in 4 patients. Two of these patients received concurrent chemoradiation while the remaining two received adjuvant radiotherapy after the primary surgery. Disruption of BBB due to adjuvant radiotherapy or concurrent chemoradiation could have led to the false-positive findings in these 4 patients. Semiquantitative analysis has been used as a supplementary tool to visual analysis of N-13 NH3 PET in brain tumors including gliomas.,, Shi et al. 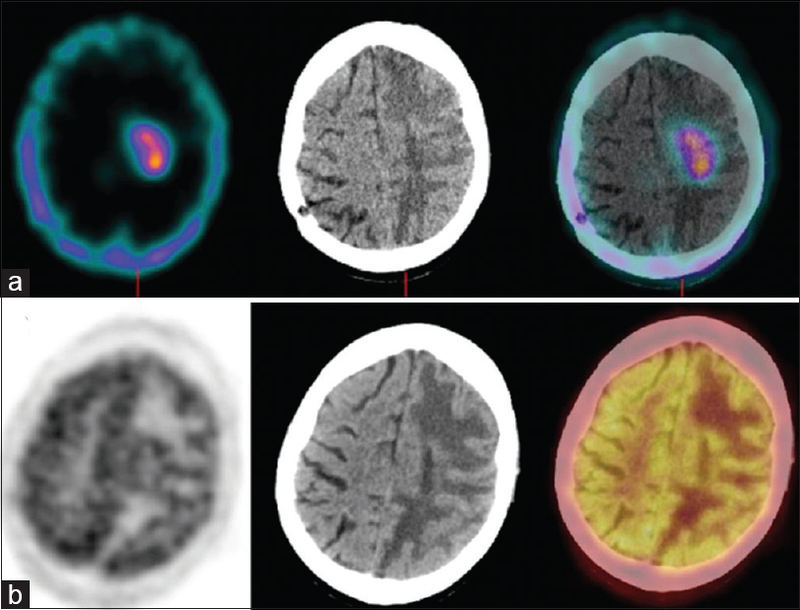 used semiquantitative analysis in untreated glioma patients and compared with F-18 FDG PET-CT. The authors reported the superiority of N-13 NH3 PET-CT over F-18 FDG PET-CT in detecting high-grade glioma. A sensitivity and specificity of 94% each at an optimal T/G cutoff of 0.86 was derived to diagnose high-grade glioma. In our study, the optimal cutoff value for T/G to detect recurrence was found to be 1.0 with a sensitivity and specificity of 67.86% and 96.30%, respectively. The study sample of Shi et al. included untreated glioma only while our study was performed in treated glioma patients with suspicion of recurrence. Tumor biology might be very much different between untreated glioma and recurrent glioma. Furthermore, the authors reported the cutoff T/G value for high-grade glioma while our study population mainly consisted of low-grade glioma patients who have been originally treated with a combination of surgery, radiotherapy, or concurrent chemotherapy. Moreover, low-grade glioma frequently transforms into high grade at the time of recurrence. All these factors could have accounted for the discrepancies between the results of these two studies. Xiangsong et al. reported superiority of N-13 NH3 PET over F-18 FDG PET in differentiating recurrent astrocytoma from radiation necrosis. The T/W ratios of N-13 NH3 for radiation necrosis and recurrent tumors were reported as 0.90 ± 0.05 and 3.56 ± 0.70, respectively. In our study, the corresponding values were found to be 1.15 ± 0.98 and 2.89 ± 1.91, respectively. Our sample population included nonastrocytoma histology also while the above study enrolled only astrocytic tumors. Moreover, sample size in the above study is small (n = 7), and PET with Ge-68 transmission source for attenuation correction was used for the scanning while we used PET-CT with CT data for attenuation correction in our present study. These factors could be responsible for the subtle differences in the values of the semiquantitative parameters between these two studies. A cutoff value of 2.0 for T/N on Tc-99m GHA SPECT-CT was suggested to label a lesion as positive for active tumor recurrence., However, in our study, we found the cutoff level to be 4.24. As explained in the results, the performances of the two modalities were equivalent even on semiquantitative analysis. However, the efficacies of the modalities decreased as compared to visual analysis when only semiquantitative analysis was used. The only exception was the high specificity of N-13 NH3 PET-CT when a T/G cutoff level of 1.0 was used (semiquantitative, 96.3% vs. visual, 88.9%). However, a drop in sensitivity compensated for the increase in specificity (semiquantitative, 67.9% vs. visual, 78.6%). We, therefore, recommend using semiquantitative analysis only as a supplementary tool to visual analysis. Our sample included mostly low-grade glioma patients at the time of first diagnosis, and the two modalities performed well. This is important from the management point of view because this subgroup of patients can benefit from early accurate diagnosis of recurrence after the primary management, as most of these low-grade tumors tend to transform to higher grade with a dismal prognosis. On the other hand, high-grade tumors at the time of initial diagnosis carry a poor diagnosis despite optimal management. One common inference from the study is that increased tracer uptake with or without CT changes in the white matter area of the ipsilateral or contralateral lobe could be radiation necrosis in those who received radiotherapy, and one needs to be cautious about false positivity in such settings. Despite being highly accurate in detecting recurrent glioma, N-13 NH3 has the drawback of short half-life (10 min) and hence the need for an onsite cyclotron which might not be available in every center. On the other hand, Tc-99m GHA is cheap, readily available, and easy to label in-house. Its high accuracy in the detection of recurrent glioma as compared to other SPECT tracers has been already highlighted., More recently, Santra et al. has shown Tc-99m GHA SPECT as superior to F-18 FDG PET-CT in detecting glioma recurrence. The additional advantage of CT in Tc-99m GHA SPECT-CT might have improved the accuracy further had SPECT-CT been used in their study. Karunanithi et al. has highlighted the equivalent efficacies of Tc-99m GHA SPECT-CT and F-18 fluorodopa PET-CT. In the present study, Tc-99m GHA SPECT-CT was found to have marginally higher accuracy than N-13 NH3 PET-CT although the finding was not statistically significant. However, the former had better target to background ratio than the latter. A SPECT tracer performing better or equivalent to PET tracers highlights the inference that the properties of a radiotracer play a very important role in functional imaging, not just the technical advancements in the hardware and methodological algorithms of the imaging system. An ideal radiotracer combined with advanced technology of an imaging system would be an ideal combination. Although introduced as a BBB agent, the different results obtained from studies using Tc-99m GHA as compared to Tc-99m pertechnetate and contrast-enhanced MRI undermine the importance of BBB breakdown as the sole mechanism for Tc-99m GHA uptake in brain tumors., An active transport mechanism for the uptake of Tc-99m GHA in brain tumors has been suggested, as it is a structural analog to glucose., Other possible ancillary mechanisms for its uptake in brain tumors might include increased vascularity, capillary permeability, rapid blood clearance, and rapid filling of extracellular fluid compartment with subsequent release from it. Further studies emphasizing these factors might be needed to ascertain the true mechanism of Tc-99m GHA uptake in brain tumors. Based on the encouraging results obtained from studies using Tc-99m GHA in comparison to contrast-enhanced MRI, other SPECT tracers, and PET tracers, further studies comparing its efficacy to other tracers such as C-11 methionine, F-18 fluoroethyl tyrosine, and F-18 fluorothymidine might add to our understanding of recurrent gliomas with a palpable impact on patient management. The present study is not free from limitations. Histological confirmation could not be obtained in all the patients. Radiation necrosis might mimic recurrence both clinically and on imaging. Thus, the use of clinical/imaging follow-up might have biased the results. The grades of glioma mentioned in the study are those at the time of initial diagnosis and operation. Thus, the grade at the time of the scans could have been possibly underestimated. The proportion of high-grade glioma is relatively small (n = 18), and hence, a definitive conclusion could not be confidently drawn. There were only one patient of WHO Grade – I glioma and 6 patients of Grade – IV glioma in the study. Hence, analysis with respect to WHO grade could not be performed. Further prospective studies addressing these drawbacks are suggested. Tc-99m GHA SPECT-CT is highly accurate for the detection of recurrent glioma. It is equivalent to N-13 NH3 PET-CT for this purpose. In developing countries, Tc-99m GHA SPECT-CT can be considered as an alternative for this indication. Ricard D, Idbaih A, Ducray F, Lahutte M, Hoang-Xuan K, Delattre JY, et al. Primary brain tumours in adults. Lancet 2012;379:1984-96. Grant R, Kolb L, Moliterno J. Molecular and genetic pathways in gliomas: The future of personalized therapeutics. CNS Oncol 2014;3:123-36. Fine HA. Promising new therapies for malignant gliomas. Cancer J 2007;13:349-54. Heiss WD, Raab P, Lanfermann H. Multimodality assessment of brain tumors and tumor recurrence. J Nucl Med 2011;52:1585-600. Keunen O, Taxt T, Grüner R, Lund-Johansen M, Tonn JC, Pavlin T, et al. Multimodal imaging of gliomas in the context of evolving cellular and molecular therapies. Adv Drug Deliv Rev 2014;76:98-115. Ho VK, Reijneveld JC, Enting RH, Bienfait HP, Robe P, Baumert BG, et al. Changing incidence and improved survival of gliomas. Eur J Cancer 2014;50:2309-18. Brandsma D, Stalpers L, Taal W, Sminia P, van den Bent MJ. 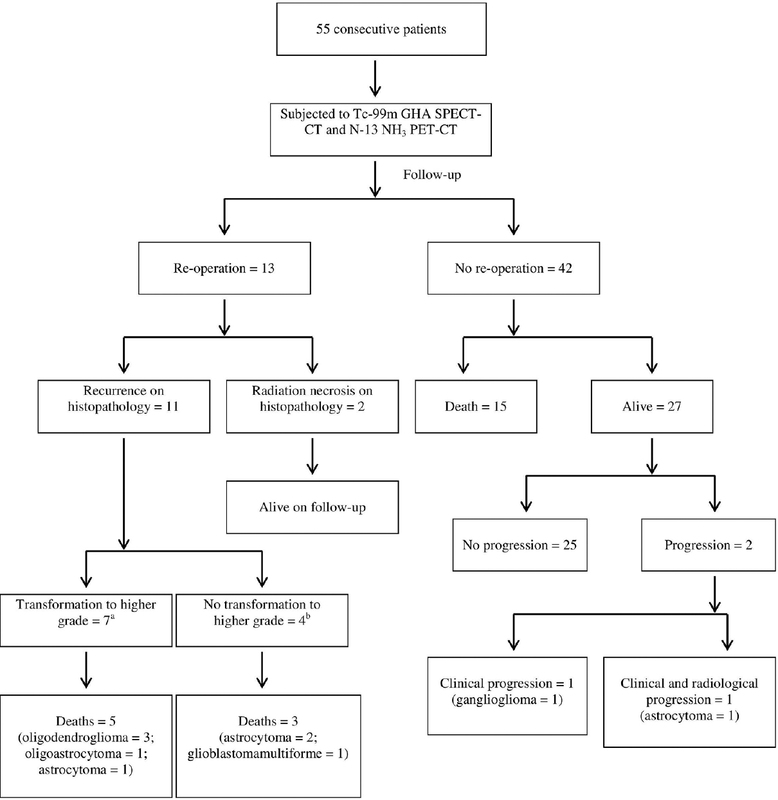 Clinical features, mechanisms, and management of pseudoprogression in malignant gliomas. Lancet Oncol 2008;9:453-61. Burger PC. Malignant astrocytic neoplasms: Classification, pathologic anatomy, and response to treatment. Semin Oncol 1986;13:16-26. Marks JE, Wong J. The risk of cerebral radionecrosis in relation to dose, time and fractionation. A follow-up study. Prog Exp Tumor Res 1985;29:210-8. Alexiou GA, Tsiouris S, Kyritsis AP, Voulgaris S, Argyropoulou MI, Fotopoulos AD, et al. Glioma recurrence versus radiation necrosis: Accuracy of current imaging modalities. J Neurooncol 2009;95:1-1. Palumbo B. Brain tumour recurrence: Brain single-photon emission computerized tomography, PET and proton magnetic resonance spectroscopy. Nucl Med Commun 2008;29:730-5.
la Fougère C, Suchorska B, Bartenstein P, Kreth FW, Tonn JC. Molecular imaging of gliomas with PET: Opportunities and limitations. Neuro Oncol 2011;13:806-19. Chen W. Clinical applications of PET in brain tumors. J Nucl Med 2007;48:1468-81. Xiangsong Z, Changhong L, Weian C, Dong Z. PET imaging of cerebral astrocytoma with 13N-ammonia. J Neurooncol 2006;78:145-51. Xiangsong Z, Xinjian W, Yong Z, Weian C. 13N-NH3: A selective contrast-enhancing tracer for brain tumor. Nucl Med Commun 2008;29:1052-8. Xiangsong Z, Weian C, Dianchao Y, Xiaoyan W, Zhifeng C, Xiongchong S, et al. Usefulness of (13) N-NH (3) PET in the evaluation of brain lesions that are hypometabolic on (18) F-FDG PET. J Neurooncol 2011;105:103-7. Shi X, Liu Y, Zhang X, Yi C, Wang X, Chen Z, et al. The comparison of 13N-ammonia and 18F-FDG in the evaluation of untreated gliomas. Clin Nucl Med 2013;38:522-6. Xiangsong Z, Weian C. Differentiation of recurrent astrocytoma from radiation necrosis: A pilot study with 13N-NH3 PET. J Neurooncol 2007;82:305-11. Khangembam BC, Sharma P, Karunanithi S, Singhal A, Das CJ, Kumar P, et al. 13N-ammonia PET/CT for detection of recurrent glioma: A prospective comparison with contrast-enhanced MRI. Nucl Med Commun 2013;34:1046-54. Khangembam BC, Karunanithi S, Sharma P, Kc SS, Kumar R, Julka PK, et al. Perfusion-metabolism coupling in recurrent gliomas: A prospective validation study with 13N-ammonia and 18F-fluorodeoxyglucose PET/CT. Neuroradiology 2014;56:893-902. Léveillé J, Pison C, Karakand Y, Lemieux R, Vallières BJ. Technetium-99m glucoheptonate in brain-tumor detection: An important advance in radiotracer techniques. J Nucl Med 1977;18:957-61. Lele RD. Tc-99m glucoheptonate is poor man's fluorodeoxyglucose. Indian J Nucl Med 2011;26:165-70. Barai S, Bandopadhayaya GP, Julka PK, Malhotra A, Bal CS, Dhanpathi H, et al. Imaging using Tc99m-tetrofosmin for the detection of the recurrence of brain tumour: A comparative study with Tc99m-glucoheptonate. J Postgrad Med 2004;50:89-93. Barai S, Bandopadhayaya GP, Julka PK, Naik KK, Haloi AK, Kumar R, et al. Role of Tc-glucoheptonic acid brain single photon emission computed tomography in differentiation of recurrent brain tumour and post-radiation gliosis. Australas Radiol 2004;48:296-301. Barai S, Rajkamal, Bandopadhayaya GP, Pant GS, Haloi AK, Malhotra A, et al. Thallium-201 versus Tc99m-glucoheptonate SPECT for evaluation of recurrent brain tumours: A within-subject comparison with pathological correlation. J Clin Neurosci 2005;12:27-31. Santra A, Kumar R, Sharma P, Bal C, Julka PK, Malhotra A, et al. Detection of recurrence in glioma: A comparative prospective study between Tc-99m GHA SPECT and F-18 FDG PET/CT. Clin Nucl Med 2011;36:650-5. Santra A, Sharma P, Kumar R, Bal C, Kumar A, Julka PK, et al. 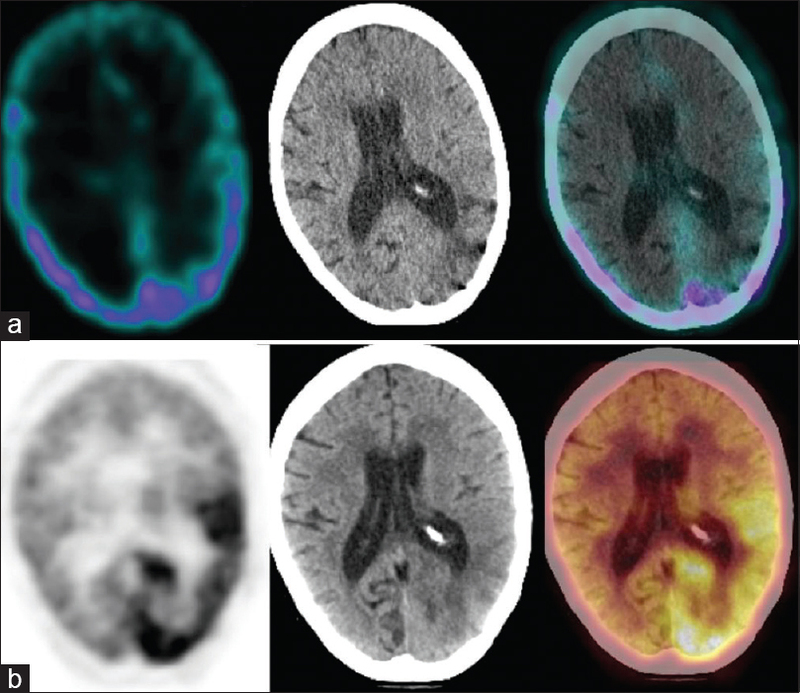 Comparison of glucoheptonate single photon emission computed tomography and contrast-enhanced MRI in detection of recurrent glioma. Nucl Med Commun 2011;32:206-11. Karunanithi S, Bandopadhyaya GP, Sharma P, Kumar A, Singla S, Malhotra A, et al. Prospective comparison of (99m) Tc-GH SPECT/CT and (18)F-FDOPA PET/CT for detection of recurrent glioma: A pilot study. Clin Nucl Med 2014;39:e121-8. Kumar R, Singh H, Jacob M, Anand SP, Bandopadhyaya GP. Production of nitrogen-13-labeled ammonia by using 11MeV medical cyclotron: Our experience. Hell J Nucl Med 2009;12:248-50. Santra A, Kumar R, Sharma P. Use of 99m-technetium-glucoheptonate as a tracer for brain tumor imaging: An overview of its strengths and pitfalls. Indian J Nucl Med 2015;30:1-8. Yamamoto H, Konno H, Yamamoto T, Ito K, Mizugaki M, Iwasaki Y, et al. Glutamine synthetase of the human brain: Purification and characterization. J Neurochem 1987;49:603-9. McCormick D, McQuaid S, McCusker C, Allen IV. A study of glutamine synthetase in normal human brain and intracranial tumours. Neuropathol Appl Neurobiol 1990;16:205-11. He Q, Shi X, Zhang L, Yi C, Zhang X, Zhang X, et al. De novo glutamine synthesis: Importance for the proliferation of glioma cells and potentials for its detection with 13N-ammonia. Mol Imaging 2016;15. pii: 1536012116645440. Wang XF, Zhang S, Ye YH, Chen YP, Liu XY. Clinicopathologic features of delayed radiation-induced brain injury after radiotherapy for brain tumor. Zhonghua Bing Li Xue Za Zhi 2012;41:224-8. Spampinato MV, Smith JK, Kwock L, Ewend M, Grimme JD, Camacho DL, et al. Cerebral blood volume measurements and proton MR spectroscopy in grading of oligodendroglial tumors. AJR Am J Roentgenol 2007;188:204-12.